The Wood Green Empire, where magician Chung Ling Soo was shot. Description: Built in 1912 on the High Road, the Wood Green Empire was one of the last designs of the noted architect. Billy Robinson from New York was a leading Victorian medium and later adopted a magicians stage name of Chung Ling Soo becoming famous around the world for his bullet catching trick. 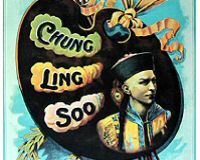 Chung Ling Soo, The World's Greatest Magician, in a Performance of Oriental Splendor and Weird Mysticism, assisted by Miss Suee Seen, presenting in rapid succession the most Beautiful, Baffling and Interesting Series of Illusions ever submitted to the Public. 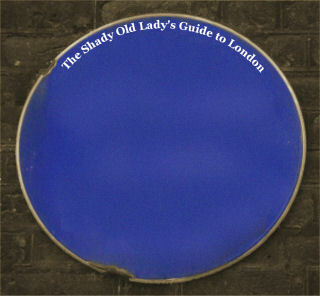 On March 23, 1918, while on stage here Soo did not catch the bullets. As the shots rang out, the conjurer collapsed to the floor and began to bleed profusely from a bullet wound in his chest. The next day, Soo was pronounced dead at a local hospital. ATV used the Wood Green Empire through to the early 1960�s. After that the theatre stood dark for a couple of years before the stage and most of the auditorium were demolished to make way for a multi-storey car park. The facade is just about recognizable today, in the centre of a parade of shops. It is currently a branch of the Halifax but the original arrangement of foyer door and an entrance either side can still be made out - as can the typical Frank Matcham grand roofline with two small ornamental domes.